A few weeks back, I caught a video on AvE’s YouTube channel of graphics drawn on an oscilloscope, given an audio input. Last week, Ben, Garrick and I decided to give it a try at OMG. According to Garrick’s research earlier that week, “older scopes” do better with this sort of thing, and OMG’s scope is plenty old. We had to do some tinkering with the settings, and the phase, eventually arriving with the left channel on Input 2, alternating vertical and External trigger (ch2). It worked best if the laptop volume was turned clear up, as it gave the best signal to noise ratio. We’d initially hooked the scope directly to a laptop headphone jack (through a spaghetti of cables), but as Eric pointed out “To be music, there’s gotta be…music”, and no devices we had would play on the headphone jack AND the internal speakers at the same time. We ended up hacking up a powered speaker to give us a stereo output and play both channels on a single speaker. This gives us something to feed the oscilloscope AND lets folks hear what the audio actually sounds like. In addition, it had a lot less noise than our initial mess of wires. As for what we played, we just searched YouTube for “Oscilloscope Music”. Someone who works with Jeff mentioned Aphex twins “windowlicker” and “songs about my cat” by Venetian Snares as two examples of spectrographic songs. 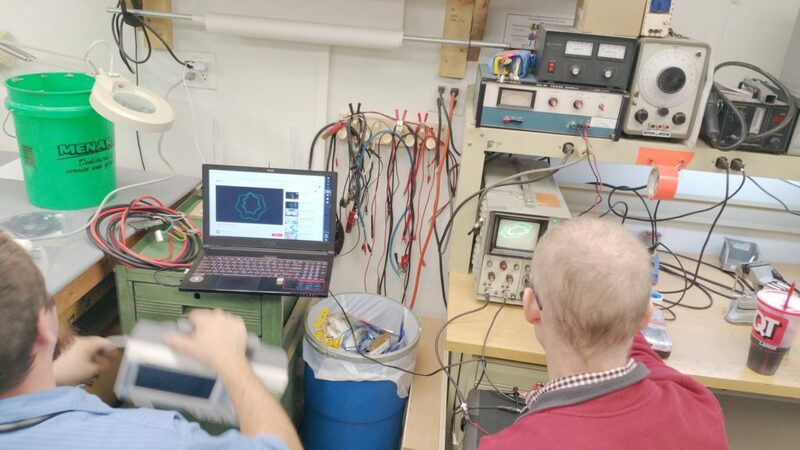 This entry was posted in Hardware, Soldering, Videos and tagged audio, Ben, Garrick, music, Oscilloscope by Kevin. Bookmark the permalink.